VIDEO: Does This Christmas Mass from 1944 Look Anything Like Yours? Readers of Liturgy Guy have very likely seen this video before. Nevertheless, it’s worth sharing again to highlight the timeless beauty of the Traditional Mass, particularly as we approach the Christmas holiday. The clip itself is taken from the 1944 film Christmas Holiday starring Deanna Durbin, Gene Kelly, and Dean Harens. The scene was filmed during Christmas Mass at St. Vibiana’s, the old Cathedral of the Archdiocese of Los Angeles. As noted by New Liturgical Movement, the music in the clip includes Puer natus in Bethlehem, the Kyrie from Licinio Refice’s Missa Choralis and Adeste fideles. Sadly, many Catholics viewing this clip today would find little in common with the Christmas Masses they’ve experienced in the past. The liturgical rupture is too significant; the break with tradition too extensive. For those who attend traditional parishes, however, the story is quite different. Anyone attending a Solemn High Mass this year will enter into a liturgy very much resembling what we see in the video. It makes no difference whether the Mass was offered in 1944 or in 2017. For that matter, the Mass shown in this beautiful clip would be immediately familiar to Catholics, not only in 1944, but even in 1844, 1744, and 1544. But not to most Catholics today. Think about that. Posted on December 20, 2017, in liturgy and tagged Christmas Mass, Christmas Mass 1944, Deanna Durbin, traditional latin mass. Bookmark the permalink. 21 Comments. This is from a movie. is how the masses were then. You’re movement, to romanticize the past, is preventing the Church from adequately responding to the challenges in these modern times. We need to TRUST the Holy Spirit to enkindle in the World a return to Authentic Prayer. Real Awesome Prayer Diirected directly to God Our Divine Father. Please stop trying to force us all to live in the past. Please encourage True Communication, Trust & Love. Where the True Sacrifuce of the Mass is experienced and truly participated in. Are you saying this mass depiction is inaccurate? Why does the mass that built the Church so scary. This is the Catholic Church – there is no past, it is eternal. Your comments are very misguided and you should think about what the Church is before posting. The video indeed is a very accurate recounting of the Traditional Latin Mass. There is no romanticizing what was precious to every single Western Catholic for well over 1900 years. I’m not sure about you, but my attendance and/or celebration of the TLM is not living in the past. Most all of my congregation are below the age of 30. Then too, I was baptized in the traditional 1962 baptismal sacrament, but all of my other sacraments were in the Novus Ordo. I’m certainly not living in the past with that pedigree! The problem is that any argument against the Traditional Mass falls flat on its face, so then the only option is to use false accusations. I prefer the Traditional Mass as did almost all of the generation of my parents and grandparents. Almost no Catholics asked for the Novus Ordo. They were not given a choice. Now I hear many bishops repeat the refrain, “no one wants the TLM.” They crammed the Novus Ordo down the throats of the huge majority that wanted to keep the Traditional Mass. They exiled priests who wanted to continue saying the Traditional Mass, they destroyed many sanctuaries, and from 1965-1970 about 30% of Catholics stopped going to Mass. By 1980, another 30% had dropped out. Mr. Gibbons, neither you nor any Novus Ordo advocate can have it both ways. I work in an archdiocesan archive and I am exposed to photographs from parishes, Masses, and holy day events from this era and prior every single day. It doesn’t matter that this is from a movie with film cameras present–it’s an accurate representation of the Mass in 1944 (and before that). No one is forcing anyone to live in the past. If you’re Catholic, much of the faith is built upon tradition. That’s one thing that makes us so much different than other faiths–the fact that we value that which came before us and we believe it has value. If you want the church of the “here and now”, there are plenty of Protestant churches for that. Its just incredible the amount of flak that Catholics who love the TLM get for wanting a Mass that is more reverent and steeped in tradition, rather than modernist Masses with guitars and drums that sound like veritable concerts. This is the only True Mass. It is the only one l attend. They were madmen who threw out this precious Gem to replace it with a cheap and worthless imitation. Holy and sublime and true is this. False and empty and meaningless is the replacement. The Holy Sacrifice of Jesus God Almighty is THE Efficacious Sacrifice. This is Roman Catholic Dogma, which even Catholics of the Coptic Rite believe. Margie, I would respectfully caution you on criticizing the NO Mass. The NO Mass is perfectly licit; where Heaven and Earth touch, and in which the Communion of Saints joyfully participate. Please take note of the locally approved Eucharistic Miracle in Poland -which is quite extraordinary – as comfort that the Body and Blood, Soul and Divinity, of Jesus Christ is present at the Altar of the NO Mass. I attend TLM frequently. My wish is that more Parishes would integrate the TLM if just for special Feast Days, monthly quarterly … whatever appropriate for the Parish. If more people were exposed to TLM, they would grow in their Faith, in my estimation. There is a politicization of TLM that contributes to a balkanization of the Church Militant. This is unfortunate, and in my opinion commentary as yours contributes to this problem. Attend TLM with an infectious joy, and respectfully I submit that you avoid disparagement of the NO Mass. – Sincerely. Many who attend Mass according to the 1962 liturgical books will not experience the second Confiteor before Communion, although the SSPX continue that tradition. If Miss Michael Oliver Gibbons is correct about the presence of cameras at Mass, then the filmed pontifical orgies at World Youth Day events, with dancing, gyrating bishops are not Authentic Prayer [sic], not Real Awesome [sic] Prayer, True Communication, Trust & Love? Actually, the Confiteor before communion is in the 1962 Bishop’s Pontificale (1962 Pontificale Romanum). In my experience, having lived in at least 11 USA dioceses and visited many more, almost every TLM I’ve ever attended has had the Confiteor before communion. Ecclesia Dei includes it in their paperback Missals. Every Pontifical High Mass presided by a bishop, when I have been present, has included the Confiteor before communion. There seems to be a very small minority who don’t seem to want the 3rd Confiteor. Theologically and legislatively, the reasons in favor of the Confiteor before communion are much stronger. The Latin rite, depicted in the film, is one of many Historical VALID rites that are part of the One True Holy Apostolic Faith. In the West the Latin rite became the Dominating rite. I’m not denying there are beautiful aspects to the Latin Mass. Since the decline of the Church, especially the rapid decline since the Council, the movement to return to the Latin rite has gained momentum. The primary reason for this is that the Forms of the “Novus Ordo” Mass are commonly executed in a irreligious, impious and irreverent manner. The blame for this should be on the Priest and the manner in which he is Praying the Mass; not the rite itself. This is not to say that the New Mass is Always Valid, by virtue of it being the official mass promulgated by the Magisterium. There are certain forms, if a Proest were to fail to follow, could invalidate a Mass of the Latin Rite also. In the Coptic and Maronite Catholic rites the forms are understood and taught in a very different manner than the rites which have dominated the West surely since Trent and perhaps as early as 1133AnnoDomine. My own theory is these challenges have plagued the west since 606ad and even perhaps as early as 325AD when Constantine Eatablished Christianity (re:Catholicism) the state mandated religion though he personally did not seek the Sacremants until his deathbed. As a Catholic who entered the Ordinariate a year-and-a-half ago, I can say ‘yes’, the Ordinariate Form of the Mass (Divine Worship) strongly resembles the video. Though Divine Worship is celebrated in hieratic English, there is/are, commonly, Latin motets and Mass settings presented. Of course, we have additions that are uniquely Patrimonial: the Collect For Purity (Sarum); the Prayer of Humble Access. The ceremonial is very similar, given the imprint of Sarum upon Divine Worship. The Church is magnificent compare to what we get. I have put together this video about the TLM and union with the Passion. It does change the way you see the actions of the priest forever. How can one be “passive” after understanding the Mass! Thank you for sharing this beautiful video. In about the 2:50 Mark, everyone seems to be entering the center aisle. I have not seen that before. What is that all about, the you know? Thanks again and have a beautiful Christmas. Some churches have the faithful approach the communion rail from the center aisle and then return to their pews via the side isles. As a senior citizen, i find it fascinating that so many young people are attracted to the TLM. We are fortunate to have a FSSP parish here, and I attend often. It is so good to see the reverence of the people. I’ve asked some young people what they were attracted to, and it was the reverence and the connection with tradition. I have myself felt that connection with the saints of past ages. We really are connected with Sts. Peter, Iraneus, Augustine, Francis, Teresa, Pio, and all faithful Catholics down through the ages. It’s the same Mass and it’s a physical connection as well as spiritual. It’s His mercy that gives us the Mass. As I think back I remember the subtle ways we were poisoned against the “old ways”. We were more mature now. We were more modern. I’m so glad I have refound my faith through the Latin Mass. What really attracted me was the teaching. That what I learned in the Baltimore Catechism is still valid, and I found out what the popes had warned about modernism and socialism. Now I have to unlearn some of the things that were put into my head, but I’m so glad that the grace of God has led me here. All the young people who are part of this movement are so fortunate. Of course they’ve got some battles to fight, but as others have said if the Holy Ghost is behind this, and I’m sure He is, then nothing will stop it. Michael Gibbons, you clearly do not know what you are talking about. I was MC for St Patrick’s Cathedral, Auckland back in the days of the TLM, and I can assure you this clip is an accurate rendition of that Mass. Incidently the sanctuary of that cathedral was completely destroyed after the NO was forced on people, and the church ended up looking like a Protestant assembly hall. Thank goodness for your comment, Fr Wayne, I thought I was going made. 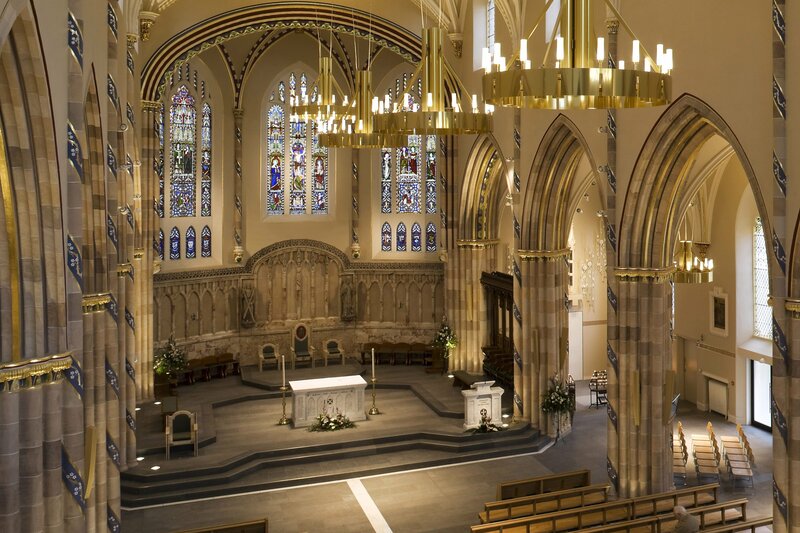 The same post-VII re-ordering of which you speak has happened at St Andrew’s Cathedral in Glasgow, Scotland: the tabernacle has been shuffled off somewhere, statues have been removed to create concert [sic] space and ensure that concert-goers are not offended by Catholic images. The sanctuary now looks like a Masonic temple. Evidence? Look below. Spot the tabernacle? Thought not! Spot an actual statue? Nope!